My parents and grandparents worked at the same job 8-hours a day (and often longer) from the ages of 16 to 65. Every morning, they'd wake up at the same time, drive to work taking the same route, eating the same lunch, and arriving home at the same time, only to wake up and do it all again the next day. There was no talk of quitting, or of staying home even when they were sick; if they could stand up without falling over, they would work. It reminds me of walking on the treadmill at the gym: Tiring, depressing, and seemingly endless. It's been drilled into our heads since we were children: Quitters never win. You don't quit a job: You just keep going in everyday and do the best you can. Keep your head down and your mouth shut, no matter how bad it is. Because being unemployed would be far worse that working at a job you hate, wouldn't it? The truth is, sticking to the same job until retirement isn't as common (or expected) as it used to be. Given the right circumstances (a better job opportunity, better perks), many people would jump from one position to another. 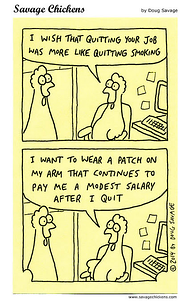 And sometimes, quitting a particular job may just be in a person's best interest. 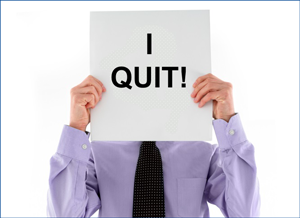 1) Quitting a job for financial reasons (i.e. not getting paid enough) isn't the only reason people leave a job - nor is it the top reason. 2) The circumstances under which men and women are more likely to quit differ a great deal. Some of the reasons people cited for quitting, or wanting to quit, are justifiable, if not understandable - like wanting to jump on an opportunity to grow professionally or leaving to deal with personal issues. Granted, turnover is a costly problem, but there is little that management can do in these situations. However, of the top 18 reasons, there are several - toxic work environment, lack of work/life balance, ethical dilemmas, and conflict with management - that are preventable. For example, implementing a zero-tolerance policy as it relates to bullying or other forms of harassment - be it physical, psychological, or sexual - is essential. HR needs to step in and get more involved when disagreements occur between management and staff. Emotional intelligence training for managers, and pre-employment assessments to determine whether a candidate's values match those of the company culture can be extremely helpful. The bottom line is that turnover may not always be avoidable, but there are measures that a company can take to reduce this tendency. If you're interested in using tests for HR purposes, request a free trial for ARCH Profile here.